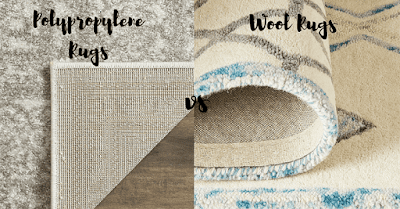 Home / entertainment / Polypropylene Rugs vs Wool: 6 Differences You Should Know Now! 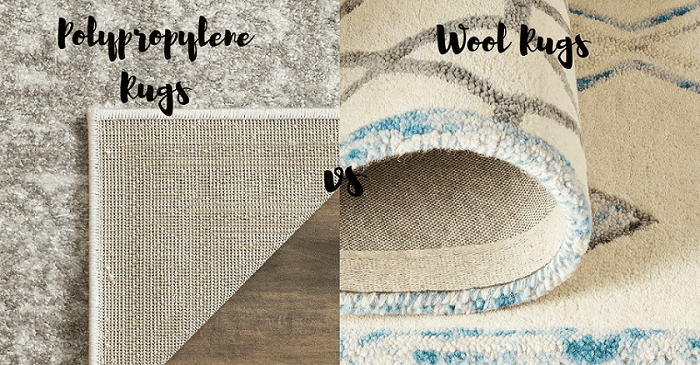 Polypropylene Rugs vs Wool: 6 Differences You Should Know Now! Polypropylene (olefin) or as commonly known as Synthetic Rugs have gained huge popularity in the market because they are cheaper and easy to make but are they safe for your house and children? Do they serve their purpose well? This material looks like wool but when you closely examine both of them you will be able to find the differences. So here is what we have done for you: we compared both kinds of rugs, read multiple reviews of people all around the globe, summarised the conclusions and our observations in this article. Wool is a natural substance and therefore rugs made from wool are 100% natural and environment-friendly. 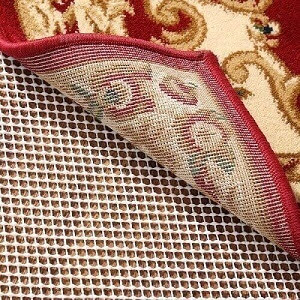 They are costly in comparison to synthetic rugs as they are completely hand-woven in a special knot to knot pattern. One wool rug typically takes around 3 months to get ready to be decorated at your home. Polypropylene is extracted from petroleum. It is man-made fiber which is treated with chemicals to give it a soft texture which looks like wool. It is machine woven and hence it is cheaper than wool rugs. Because of its low cost, it is very popular in the market. It is easy to add designs to a synthetic rug. To add color to the material it is again treated with many chemicals which makes it harmful to the environment as well as your family. When you are investing pretty amount on the rug then you will definitely want it to be long-lasting. Wool Rugs may cost you a few extra bucks but they will serve you a decade. You can pass on your possession to your children and even grandchildren as the wool rugs have an age of over 50 years. On the other hand, the polypropylene rugs only last for 3-5 years at most. Since they are treated with too many chemicals before they can be sold, the surface of the rug becomes brittle with time and starts breaking. Rugs made out of wool are truly environment-friendly as the material is a gift of mother nature which also provides as a warmer in chilling winters. Wool is a natural noise insulator. It prevents from echoing in the house and shield you from outside traffic noise. However, many may argue the fact that wool is shaved out of sheep which is not quite being friendly. Yes! it is true, wool is made out of sheep fur. Though many believe that sheeps feel good after getting shaved like us and they grow new fur very soon. Synthetic fiber is extracted from petroleum, treated with chemicals in the factory and then is tufted by machines into a rug that is so attractive and hard to avoid. The factories after treating the fiber with different harmful chemicals and toxins, release the waste in rivers and air causing water pollution. These same chemical infused rugs are decorated in your homes, you walk on them, you sit and relax on them and unknowingly you are breathing the toxic volatile organic compounds(VOC's) released by them with time. If you have babies in your house then I would suggest you to highly avoid buying synthetic rugs. The best quality of wool is its flame resiliency. Wool is flame retardant. It does not burn but forms a self-extinguishing layer that keeps the fire from spreading. It is used in airplanes because of this quality. You will never have to worry about your rug catching fire till it is a wool rug. Polypropylene rugs, on the other hand, are highly flammable. Petroleum being the base material makes them vulnerable to heat. Therefore you must not use these kinds of rugs in the kitchen area. Also, do not keep them under the open sun in high temperature, they melt easily and, may even catch fire. If you have beautiful hardwood flooring in your home then avoid using these rugs as they have spoiled and scratched many people's hardwood floors. Polypropylene rugs are made by machines and a machine can weave more than 100 rugs in a day depending upon the size and shape of the rug, which is a huge factor resulting in lower costs. But because of their look which is almost similar to that of a wool rug, they are often sold at a high price when their actual cost is less than half of the quoted price. Wool rugs are natural and made with great effort. One wool rug carries the craftsmen's labor and skills which stays intact for a lifetime. This makes the cost of the rug an amount worth spending and makes the rug a family property that can be passed from generation to generation. Wool has a soft feel and when woven into a rug provides a great soft and luxurious experience. It's softness remains as it is for a decade. Fake wool or olefin rugs are made to feel soft but this softness wears out very soon. The fiber becomes brittle with time. This brittleness results in torn sides. Wool is water repellent making it an ideal choice for dining areas where most of the spilling occurs. Wool rugs are very easy to clean. Wool rugs contain tiny pockets that hide dust and pet hair and therefore need not be vacuumed each day. Olefin rugs have the same water resistant but are prone to oil spots caused by walking barefoot on the rug or by puppy paws. These oil stains are needed to be professionally cleaned at least once every year. They are also highly prone to dust as they don't have pockets like that of wool and therefore need to be vacuumed every day. Also Read: Quick Tips On How To Shave A Matted Dog At Home? How to find out which is fake? Examine the back of the rug. If the design is same on the back as on the front then it is a wool rug. The back of an olefin rug is usually hard textured whereas wool is soft on both sides. When looking for a quality rug, run your fingers through the rug piles. You should not be able to run your fingers through the pile very easily. This displays a high knot content resulting from a thicker, higher quality pile. Now you know everything about wool rugs and polypropylene rugs. Our choice is wool as it is a great investment which will serve a lifetime and it has so many qualities. Which one you would like to go with - Cheaper or Better?